Tetris running on the emulator, showing the graphical glitch it has with sprites. On week 3 of this project, and am excited to say that the Game Boy Emulator can now play *some* games! As of now it is only failing for the "HALT" instruction, with all other instructions passing Blargg's CPU instruction tests. Additionally, rendering of the background, window (untested), and sprites are implemented. The above picture shows the one problem with sprite rendering for now: Sprites do not render on the bottom 16 pixels of the screen and worse yet they sometimes render a bit funny. With the current progress of the emulator, you are able to play Tetris, which is pretty awesome considering this is not just my first game that works on the emulator, but was also the first game I received when my Dad gave me my Game Boy over 15 years ago. Over the past week I started one last big project in my spree to test out what I can do these past few months. As seen in the above screenshot, I've been working on a Game Boy emulator! As with my past projects, the only dependency is SFML which I use for rendering (I'm thinking about splitting up the project into two to remove the SFML dependency, since the SFML code is literally a few dozen lines). The project has been pretty smooth so far and I'm able to run very basic ROMs but am still a ways off from running full fledged games. Probably the most difficult part of setting up the emulator is that you need quite a lot already established to run even the most basic ROMs, and on top of that I had to manually implement over 400 instructions for the modified Z80 processor being emulated, which took 3 days of grunt coding to finish. Thankfully, I was able to use Imran Nazar's jsGB emulator as a base off which I implemented the instructions. Unfortunately, while a good reference, I had to use another reference to go over every instruction and correct mistakes I found, which were quite a few and a bit frustrating (and I'm still not sure I caught all the mistakes). At least for me, it's almost guaranteed that writing hundreds of instructions will result in some typos and mistakes, which is where test roms come into play. Thankfully, there exists an entire suite of test ROMs that test all the instructions and features of the Game Boy to see if it is compliant. I've been using the BGB emulator's debugger as a base to compare my emulator to. I go through each instruction and make sure they, and the registers, match BGB's. On GitHub there is a private repository for this project setup, and hopefully in the next few weeks I can make it public. This project really takes me back because the Game Boy is my all time favorite console, and it's really fun to be able to implement my own take on it. Recently I completed the first draft of a new header only C++14 library I've been working: "SerializeQueue". The basic idea is that you push all your values onto the queue, serialize it to a binary file, then later load and deserialize the binary file back into a queue to pop data off of. What this does is it takes the address of the variable, treats it as a pointer, then tells the compiler to treat that pointer as a pointer to a different type before dereferencing it. These functions are inline, and the tag itself is just an empty struct, so it ends up being optimized out of the program which eliminates the overhead of the tag. The basic idea behind this, for cases of std::vector, is that a special overload exists that accepts a tag of std::vector among other types specialized for. The last and current problem I'm working on is implementing tuples. Tuples are difficult because it is a container that holds multiple data types, and requires template metaprogramming to implement. I just started reading Modern C++ Design to try to get a better grasp on this new programming method, but it's definitely a wall that I've hit with what I can do. Hopefully I can come back and flesh out the tuple implementation once I learn more about how to deal with generics. For now this library only supports tuples of basic types. After a month of development, BubbleGrow is finally ready to be released as open source. 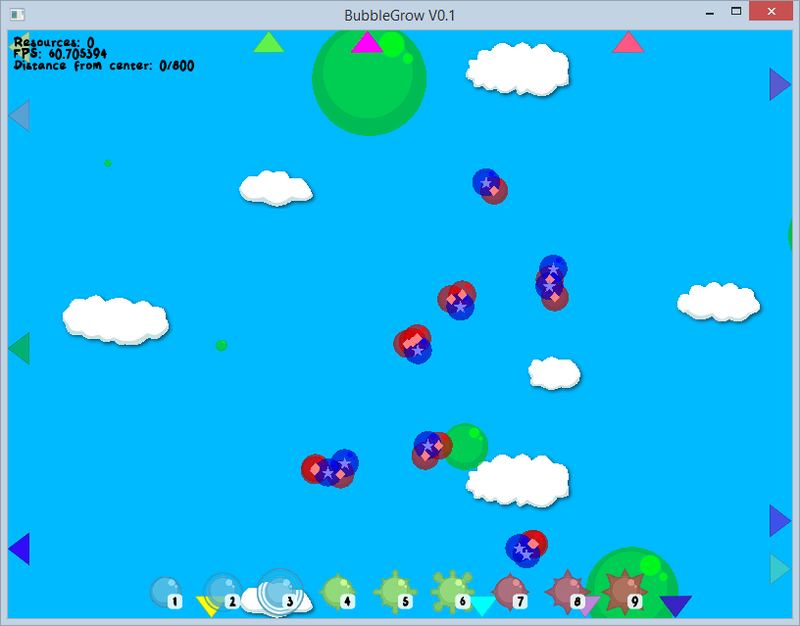 BubbleGrow is a simple game whose gameplay revolves around building an army of bubbles to gather resources and fight against other players, with the winner being the last man standing. 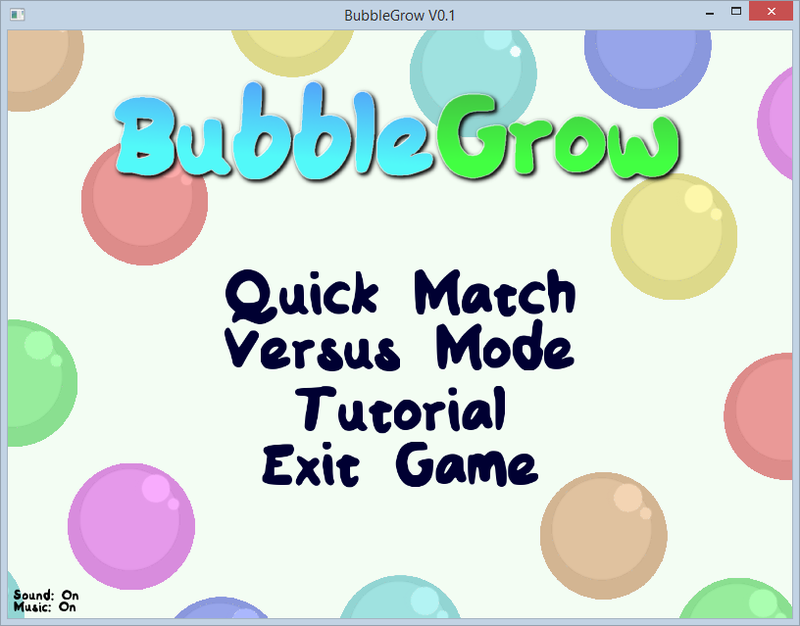 BubbleGrow's only dependency is SFML, which, along with only using the standard library, makes this game cross-platform across Windows, Linux, and OS X. It's been tested on both 32 and 64 bit platforms with no performance issues (even ran it on an old dual core Pentium from 2007 with embedded graphics). BubbleGrow takes advantage of OpenMP to support multithreading up to as many cores as you can give it (assuming you have up to 1 thread per player, or up to 16 threads for default gameplay). The beauty of OpenMP is that it won't prevent compilation on compilers that do not support it, since it only uses preprocessor pragmas which can be ignored. This game is almost completely licensed under the MIT license, with the only exception being the audio and font, which have their own licensing. The source code is completely open and free to modify, and for anyone who chooses to use the source code, they can do it without any requirements as long as they do not redistribute the source code without the MIT license.